Sleek and formidable; a masterpiece of high-tech miniaturization. 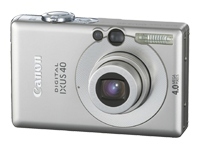 The tiny 4.0 Megapixel Digital IXUS 40 is a seductive blend of extraordinary power, flawless styling and super high-speed processing. The 4.0 Megapixel sensor on the Digital IXUS 40 is ideal for prints up to A3 size. One secret behind the super sleek and slim body is a new UA (ultra-high refractive index aspherical) 3x optical zoom lens, which delivers outstanding, uncompromising image fidelity in an incredibly compact size. The large, high-definition 2.0" LCD screen allows immediate review of images and playback of very long high quality 30 fps VGA movie clips with sound (recording of up to 1GB movie files possible). You can even shoot up to 60 sec of fast QVGA action at 60 fps for slow motion review. Canon's DIGIC II processor links all key camera functions and includes a dedicated movie processor, driving fast auto-focus, outstanding camera performance and quick start-up times. Highly complex image processing algorithms necessary to deliver superb image quality are handled fast and efficiently to keep you ready for the next shot and to allow for rapid, smooth continuous shooting. iSAPS instantly analyzes the scene and makes adjustments even before the shutter release is pressed. It optimizes exposure, white balance and auto-focus settings in every shooting situation for consistently brilliant results. Six scene modes help you create great results with confidence in tricky shooting conditions, while a fully automatic 9-point AiAF system gets even off center subjects sharply in focus. Connect the camera to any PictBridge compatible photo printer, push the Print/Share button and within seconds, you'll be holding a full color print - it's that simple. When connected to a Canon SELPHY CP series printer, you can even print handy ID photo prints.